Twice in one day! Came home last night to a huge box on the doorstep which could only mean more plants I'd ordered and then forgotten all about (I should probably point out at this juncture that I don't drink, I'm just very forgetful). And now that it's morning I can have a good look at them: Three Harlow Carr primula hybrids looking incredibly vigorous considering they'd been in the post for 5 days (and the Royal Mail get all arsey when anyone mentions the "P" word). 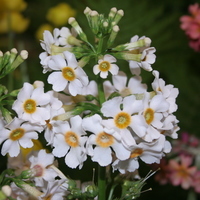 Also in the candelabra group was the more petite but extemely beautiful Primula japonica "Apple Blossom". Also in there was Meconopsis betonicifolia, the legendary Himalayan blue poppy, and another, unlabeled meconopsis which I think is horridula, so named because of its spiny leaves and stems, not because it's horrible (I've only ever seen it in the wild, at about 3,500m in the Tsari valley in Tibet and it was a rather washed out purply-blue and right in the middle of a huge rose bush so it is quite horrible). Finally I was confused to unwrap a pot with the label "Aubretia Joy", knowing that being the snob I am I would never order something so common! 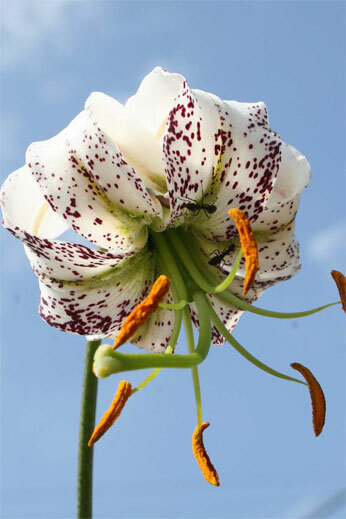 In the daylight I realise it has "Lilium duchartrei" written on the other side. Result! But one day should look like THIS! Candelabra primulas "Harlow Carr Hybrids" nd, on the right, Primula japonica "Apple Blossom"
In fact this image is from the catalogue of Slack Top Nursery, who sold me the plants, so I'm sure they won't mind me using their picture!